A plant with enormous leaves hovered over the pond at Chartwell, Sir Winston Churchill’s home in Kent, England. More than twenty years has passed since we were at Chartwell, but I can recall that plant as if I saw it yesterday. 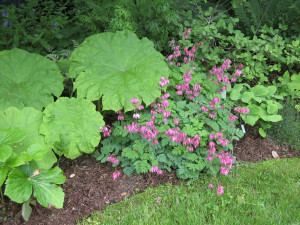 It was a Gunnera (most likely Gunnera tinctoria which is sometimes called the Giant Rhubarb) and I really coveted it. The winters in Kent are comparatively balmy and it was flourishing there. Gunnera is rated as hardy only to Zone 7 (where the winter cold may drop to 0 ℉) so I know there is no point trying to grow it in my Zone 4 Vermont garden. But I can and do grow lots of plants with big leaves. Big leaves are not for the timid, but for the adventurous gardener will find they will deliver texture, punch and drama. And while big-leaved plants are more often associated with the humidity and low-light of a rain forest, there are plenty of large-leaved beauties that will thrive in the average garden. 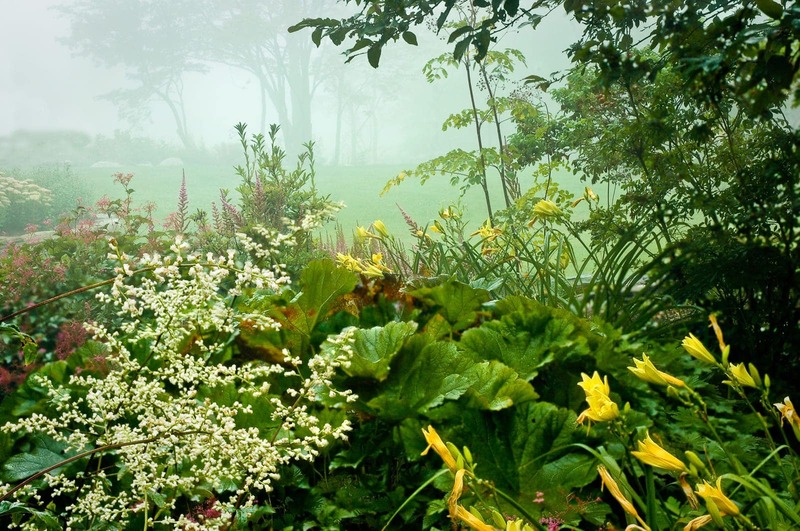 Here I look at some of the best of them for cooler climates (where stalwarts of warmer climes like Gunnera will not prove hardy), and show how to make beautiful, long-lasting compositions in the garden by combining big leaves with contrasting companions. An added bonus is that large-leaved plants, including our well-known hostas, do well in the shade, their leaf size being a natural adaptation that allows them to gather more light for photosynthesis. 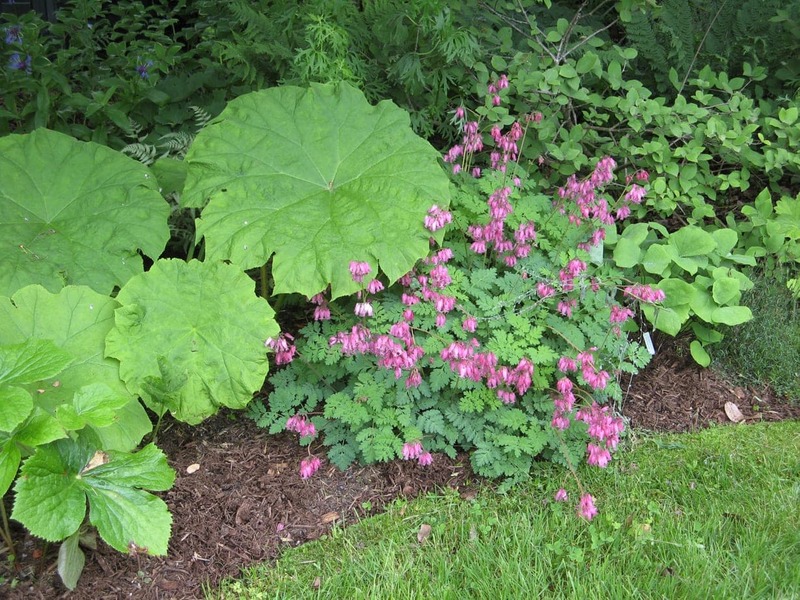 You can find them a great selection of big-leaved plants at Cady’s Falls Nursery in Morrisville, Vermont. The prize for the largest leaves in my garden goes to Astilboides tabularis, a plant that hails from Korea and Northern China. Its flat floating discs are full 2 feet in diameter, just slightly angled on relatively short stubby stems. 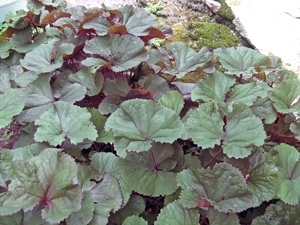 Thus the overall height of the leaves is only about 30 inches, making them excellent companions for low growing plants. Here they are with the fringed bleeding heart (Dicentra eximia) for a striking texture contrast. The leaves are the main reason I grow Astilboides. It also has small plumed flowers on 5 foot stems, way above the leaves. They seem to pop up as an afterthought, and I usually cut them down in short order. 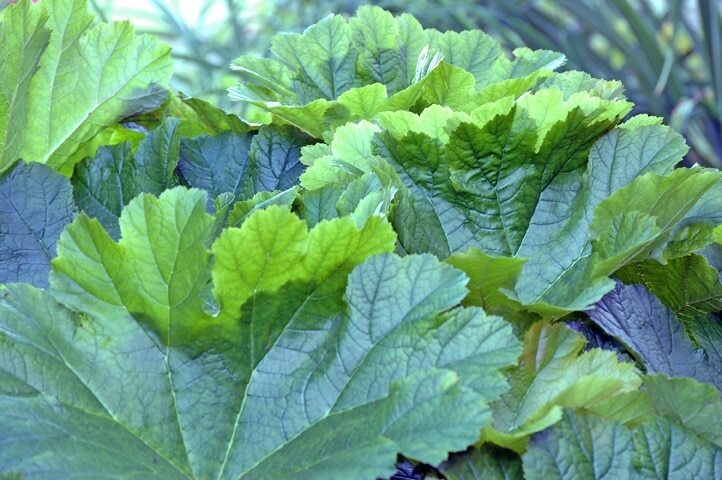 Garden visitors always admire the umbrella plant, Darmera peltatum,which originates northern California and Oregon. It has 20 inch leaves that catch water in a little hollow at the base and it grows in the dappled shade behind our gazebo. Since Darmera loves moisture chose this spot so that it could enjoy an extra dose of rain from the roof runoff. Over five years, it has rewarded me by expanding, as a single clump, to 7 feet across and 4 feet high… and it’s still growing strong. However, for all its size, it is really well behaved and does not put out running roots. 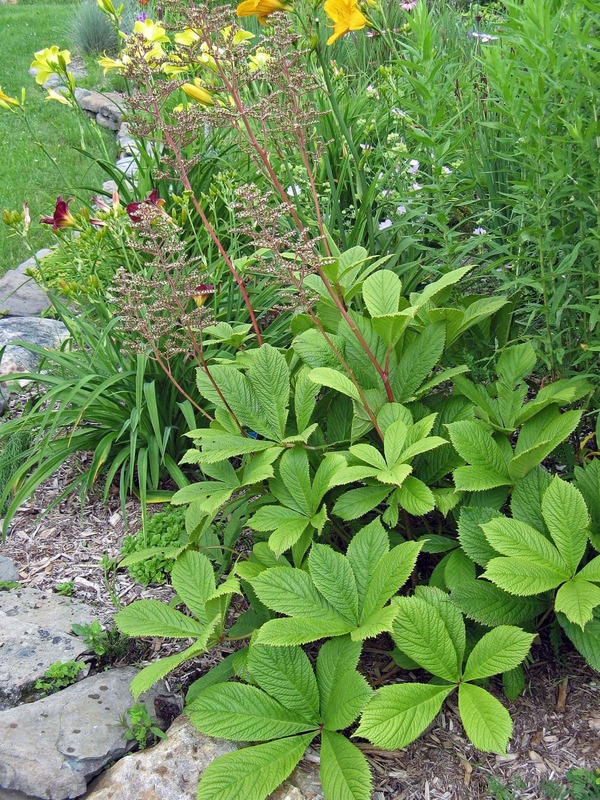 I really enjoy the creamy plumes and crinkled palmate leaves (with an overall leaf diameter of 12 inches or more) of Rodgersia aesculifolia, which also originates in Northern China. 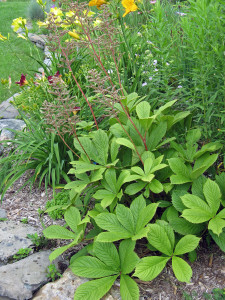 In this picture, you can see the daylilies in the background have finally started to bloom; but ever since May the Rodgersia has been making this corner of the garden a bit more interesting. Interestingly, in the American Horticultural Society’s Encyclopedia of Garden Plants, all three of these plants are all ‘officially’ rated as only hardy to Zone 5, though I have seen them listed as Zone 4 in other sources. I planted them about 10 years ago, siting them carefully, and they have all grown beautifully in my garden. Finally, I am very fond of the striking foliage and yellow daisy-like flowers of Ligularia dentata ‘Desdemona’, another plant coming to us from China. Its has a prolific display of yellow daisy-like flowers in early fall, and the progeny from my original plant have created a large colony in a difficult spot under the cherry tree on the north side of our house. Like other plants with good-sized leaves, ligularias grow well in the shade, where they produce larger leaves, and are far less prone to the ravages of voracious grasshoppers. I am always on the look-out for plants with interesting foliage… whether large or small, fine leaved or big leaved, and also in colors other than green. Against each month’s changing parade of flowers, great leaves go along way to spice up the garden all season long.